South Dakota is a pretty quirky place when it comes to landscapes. There's plenty of flat farmland here, of course, but there are also the glacial lakes and forested groves in the northeast, tall river bluffs along the Mighty Mo, isolated big sky prairies in the west, and - our personal favorite, natch - the ancient tree-covered mountains of the Black Hills. And since travel is such a big industry here, there are cute and unique places to stay everywhere you go in the state. Which is why we were surprised (and very honored!) 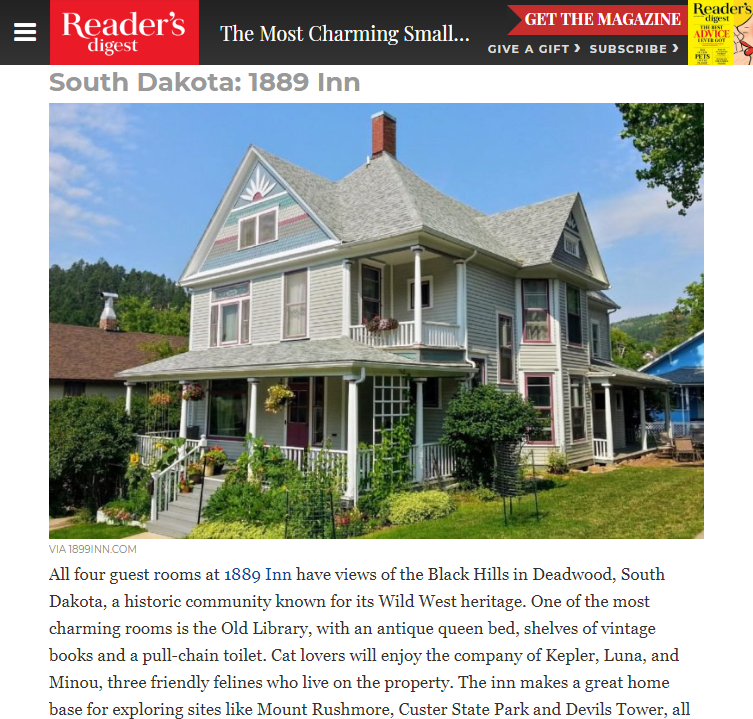 to find out yesterday that Reader's Digest just called the 1899 Inn the Most Charming Small-Town Bed-and-Breakfast in South Dakota. Among the features they liked best: the vintage books in our Old Library room, how close we are to places like Mount Rushmore and Devils Tower, and - of course - our three resident cats. It's a really fantastic list of small inns from around the country, and we're thrilled to be in such great company! If you're planning a road trip across America this summer and like to stay in unusual and endearing places, the article is well-worth a look. Some of our favorites are the stunning Kehoe House in Savannah, Georgia, and the historic church that's now Christopher's Bed-and-Breakfast just outside Cincinnati, Ohio. We hope we get a chance to welcome you here In Deadwood sometime soon. But wherever you go this summer, happy travels!